If you have been watching Anime long enough, you will come to a point where you can clearly say with conviction your opinion on marathoning a series. Marathoners believe that if you watch something all at once, you keep everything fresh in your mind, making emersion a prime directive. Non-marathoners on the other hand believe that one should take the time to divide a show up over a stretch of time, longevity being the name of the game. But every so often you will come across a film series like Garden of Sinners (humor me a little here people) or a tight-knit OVA series like Giant Robo (something that I want to see covered on this very site) and ask yourself if making the viewing experience into a marathon is the only way to victory. Well Biskmater and I thought that if we were ever going to effectively cover the 2010 anime film series Broken Blade, we would have to marathon it together. What follows is an experiment involving two guys, one TV, and a ton of couch sitting. Some God have mercy on our charred souls. Broken Blade is based on a still running manga by Yunosoke Yoshinaga, consisting of six forty-five minute film parts. Every episode was directed by Tetsuo Amino, director of all things Macross 7 from the nineties and Starship Troopers OVAs from the late eighties (the idea alone that Amino was stuck directing the dreaded Starship Troopers anime is far funnier than any slapstick Macross 7’s comedy could pull off astounds me). Amino was also involved in many of the Super Deformed Gundam properties, meaning that he is tangentially qualified to direct a mecha series. Biskmater: Broken Blade tells the story of Rygart Arrow, a young man of twenty-five, who lives in the country of Krisna. Rygart’s most noteworthy trait, in a world where nearly everyone has the psychic/magical ability to manipulate certain crystal quartz, is his lack thereof. This presents problems when all of human society has adapted to utilize this quartz, to the point where Rygart cannot operate vehicles or anything above simple machinery, even a light switch. Worst of all, he cannot use those cool, shiny mecha called Golem that the world uses to wage war. It does help however, to have been school mates and best friends with the country’s King Hodr and Queen Sygin. Unfortunately, Krisna is at war with the commonwealth of Athens, where Rygart’s other friend Xess has become a distinguished officer leading an Athenian squadron providing the series earliest conflict. Biskmater: Rygart has been summoned by King Hodr to return to the Krisna capital from Rygart’s small farming village. Once Rygart meets his childhood friends for the first time in over five years, Rygart realizes that some things change while others stay the same. King Hodr asks his old friend to stand by him and fight for his country. Rygart’s feelings of uselessness concerning his inability to manipulate quartz almost sends him back to his farming life; but shortly after Krisna miners discover a thousand year old Golem, Queen Sygin’s engineer’s skills deduce that Rygart is the only one that can pilot this old frame. This leads Rygart down the bloody path of war, as he struggles to protect those he cares about, as well as overcoming his inhibitions regarding conflict and violence. Pros: I appreciate giant robot related series where the leads where not still in high school (Godannar, certain Gundam shows, and certain Go Nagai shows notwithstanding). Not to sound clique but the mecha in themselves are the most interesting aspects of Broken Blade. The focus of combining magic and science leaves Broken Blade filled with lumbering damage riddled mecha blasting rivet guns and brandishing metal slab swords; I love laser and missile volleys as much as anyone, but Broken Blade provides a well warranted break from the mecha-mold. The series really starts to heat up once the pilot Girge is introduced. 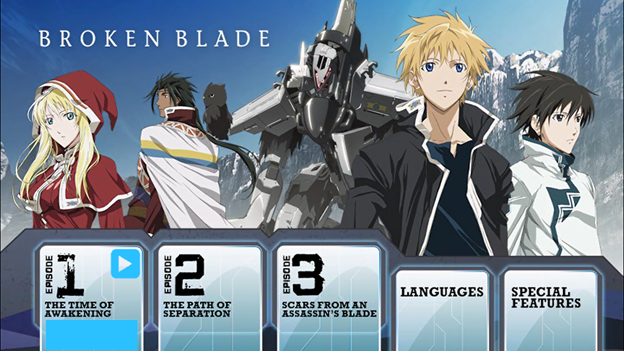 Biskmater: The thing I enjoyed the most about Broken Blade was its approach to mecha. Rather than giving us lasers, missiles, bombs and other futuristic weapons, it gives us simple blades, shields, spears and primitive guns. As such, the battles between golems are more brutal than your usual fare, shields are shattered, armor is crushed and mechanical limbs are torn off. All the while Rygart’s mecha the Delphine, manages to avoid critical destruction, as a protagonist should. Cons: Broken Blade looks less like a film then a short TV series with most of the budget going to the fight scenes. 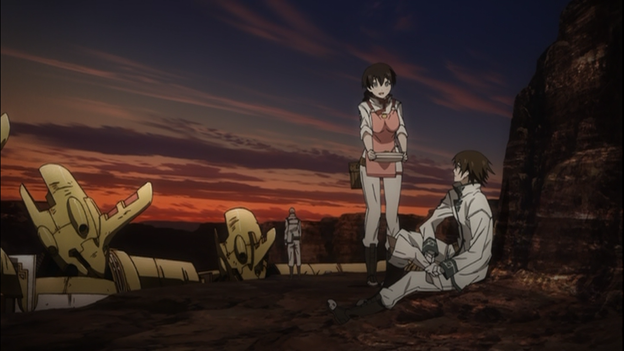 If it did not involve mecha on mecha action, the animation was gravely inconsistent, especially when character models were involved. Precipitance amounts of strategy in combat left me with un-amended high hopes. 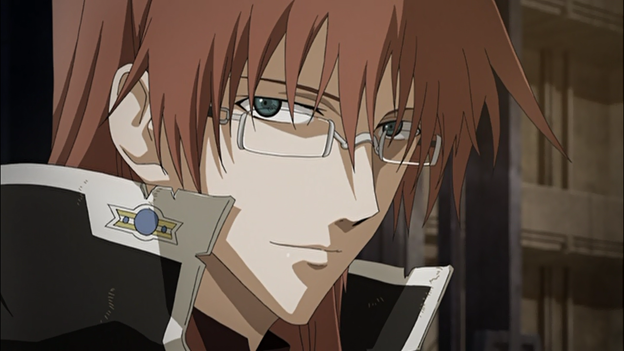 Biskmater: The pacing in Broken Blade during the first episodes seems to drag on a little. It gets progressively better as the episodes go on, but is still very noticeable. My only other real problem was the series gecko ending (an original, different ending from the source material, mostly used when the series are not yet complete) which didn’t solve much of the plot; except that the war’s current flow may be changing for the better. 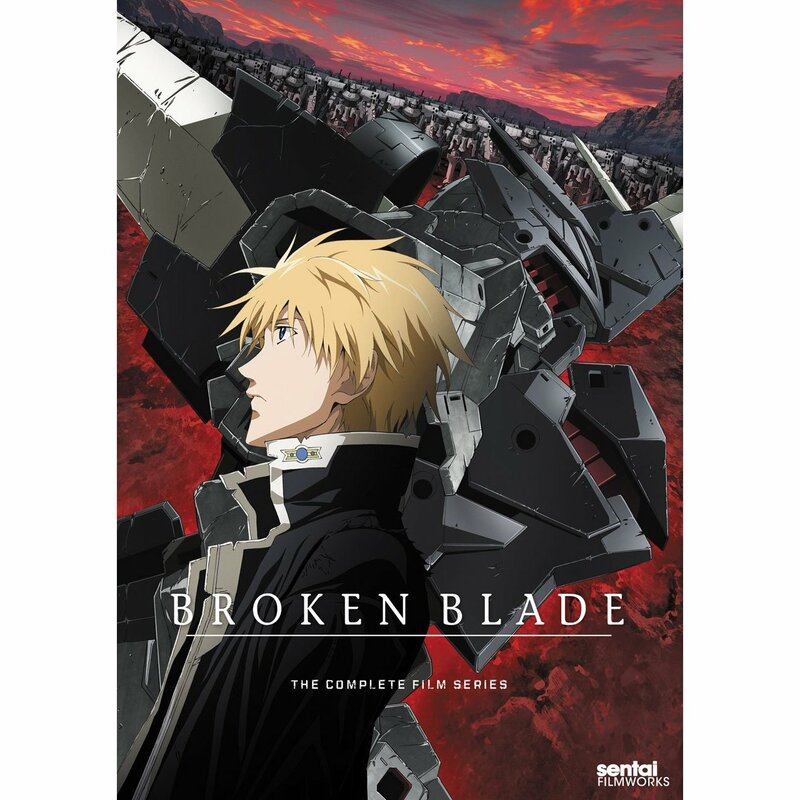 Sentai Filmworks released Broken Blade in one complete collection. Broken Blade to me was honestly missing something key to success, but when Girge showed up in part three, I knew that sticking with it was the right decision. 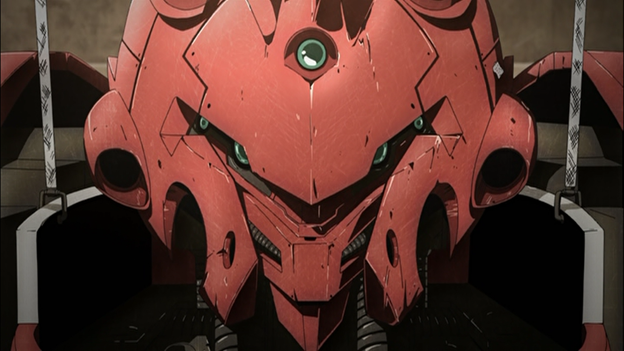 I saw a neat fantasy setting with well animated mecha fights; that to me is worthy of giving praise and recommendation. Biskmater: Overall, Broken Blade is a good series of films that contains high entertainment value once they pick up the pace, but is ultimately not a definitive adaptation of the original manga. A good series to pick up if you are looking for unusual and well done mecha fare, but don’t expect to find much closure in the plot.